Last year when Microsoft announced its upcoming release of Windows 7, I signed up on Amazon's preorder list and took advantage of the half-price offer. The product arrived promptly on the release date, back in October. I opened the box, put it on the shelf and that's where it had been sitting all this time. Up until Saturday, that is. Finally, I decided it was time to install the upgrade. I'd been debating about whether to do a clean install or just upgrade over the existing operating system on my PC, which was Vista. Normally I would do a clean install but having heard from several people who said they just did the upgrade and it turned out fine, I decided that's what I would do. If for some reason it didn't turn out fine, then I'd just reformat the drive and do a clean install. I even bought more RAM for the computer, to take it from 4GB to 8GB: two sticks of 4 GB RAM. I took out the old chips, put in the new, booted up the computer and .. it showed only 4 GB. One of them was broken? Or not installed correctly? I opened the case back up and checked but they looked okay so I removed one to see which one was bad. I booted up the computer and this time it only showed 2 GB of RAM. After pulling out the manual I discovered that the motherboard could only recognize 2 GB of RAM per slot. Outdated already! So my getting a 4 GB stick of RAM was a futile effort. Also since I had bought the memory back in October there was no use trying to return it. I went back and put the other 4 GB stick in plus the other two older 2 GB sticks. That should give me 8 GB, right? Nope, it only registers 6 GB. Well, that's good enough. If Windows 7 doesn't run right then I'll deal with it. It was 3:00 when I finally clicked on the Install button for the upgrade. I'd read that the upgrade could take several hours so I was curious as to just how long it would take. With the screen seemingly frozen doing "upgrading" at 6:00, we went to dinner. When we got back around 7:30, now the screen said that it was expanding Windows files (21%) but it had to gather more information before further expansion and so please wait. At 8:00 it said the same thing. And at 9:00 and 10:00 and 11:00. Finally I went to bed with the screen looking the same as it did at 7:30. Could it possibly take this long??? And still at 21%??? You can guess what the first thing I did was after getting out of bed on Sunday. I went to look at the monitor and.. Windows 7 was now installed!! So sometime during the night it finished. I couldn't believe it would take that long. I don't know if any of you have tried doing the same upgrade, but if you did, leave a comment about your experience. I think Microsoft ought to give you some an idea of what they mean by "several hours." 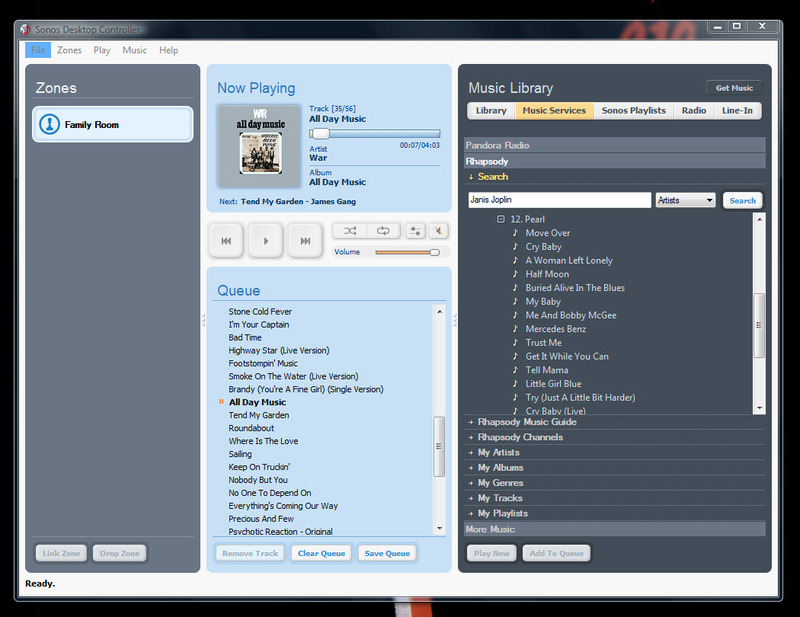 Sonos + Rhapsody = great combination. Thumbs up! Well folks, I am ashamed to tell you that today I compromised my principles and did something I said I would never do. I ordered Avatar on Blu Ray from Amazon. All of the clips and previews I have seen look really stupid. I had no desire to see the movie. I don't like James Cameron because he is an egomaniac and why should I put another penny in his pocket. Katie saw it and said the plot was predictable and dumb, but the scenery and effects were spectacular. Julie's brother and his wife raved about it - well actually, raved about the scenery in 3D. They said if it wasn't in 3D it wasn't worth seeing, so that told me right there that the movie couldn't possibly be that good. But yet I ordered it today. Now why did I do that? The review at Blu-Ray.com went along with everyone else and said the storyline and acting were poor. But it also raved about the video and audio quality of the movie, saying it was jaw dropping and had raised the bar for home theater video. That's why I bought it - like any audiophile, I can't pass up the opportunity to try something that is supposed to be that incredible, just to see how it looks and sounds on my own system. I don't care how good it looked or sounded in the theater, I just want to try it out at home. Many are complaining that this version is just a teaser because it is not in 3D and has no supplemental material, just the movie; they're saying the studio is milking it for all its worth because they will release a more deluxe edition down the line, and then the 3D version, making you spend more and more money. I could care less about extras or 3D - I just want to sample the movie itself! But I still think the characters and the plot seem stupid. I used to be a member of Classmates because one time they offered some special promotional rate that was like half price and I figured what the heck, it is cheap enough to join and then see all these things in the site that you have to be a member to see. After my one year was up I didn't renew because all those things that you have to pay to see aren't worth paying to see. But they still have me on the mailing list so at least once a week I get some tantalizing tidbit about so-and-so updated this or joined this or said this or whatever, and sometimes I will click the link to see who they are talking about. The other day I did just that - clicked the link, and saw a name I recognized, first name Vicky. I didn't know her as she was two years younger than me, but I knew who she was. That got me thinking, there are lots of people that were at my schools that I didn't know, but I know who they are - I would recognize the name and/or the picture (then, not now.. like I would never recognize Vicky but that's partly because I don't remember what she looked like back then, either). So I wonder how many people that I didn't know from school know who I am? It kind of surprises me when someone tells me that they ran into so-and-so and they remember me, because I didn't think they would. On the other hand, I guess I should realize that no matter what, people are constantly checking each other out. We just don't know it because they are so sly about it. Guys all know who the girls are in the school even if they've never talked to them before.. (or at least all the "fine" ones, haha). That sort of goes back to my post from long time ago on how my friend JT was nuts about this 9th grader when we were lowly 7th graders. We sure knew who she was! But I doubt it was vice versa. Some times you know you are in the mood to listen to a certain song or album but then other times you feel like listening to something but are not quite sure what to play to suit the mood. So you put on a track and hope it fits. 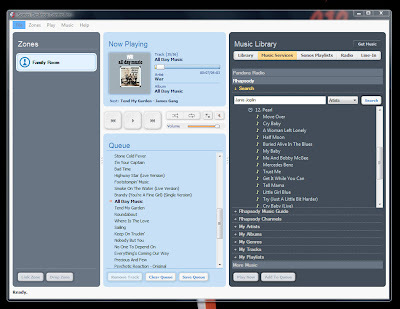 That was what I did today - I put on Simon and Garfunkel's "Bookends" CD and it hit the spot. What a great album. Hard to believe it is 43 years old. As seems to be ongoing this week, I don't seem to have much to write about. 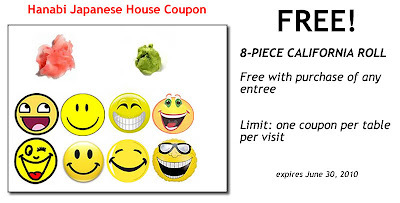 Here is a coupon I did for the Japanese restaurant near our house. 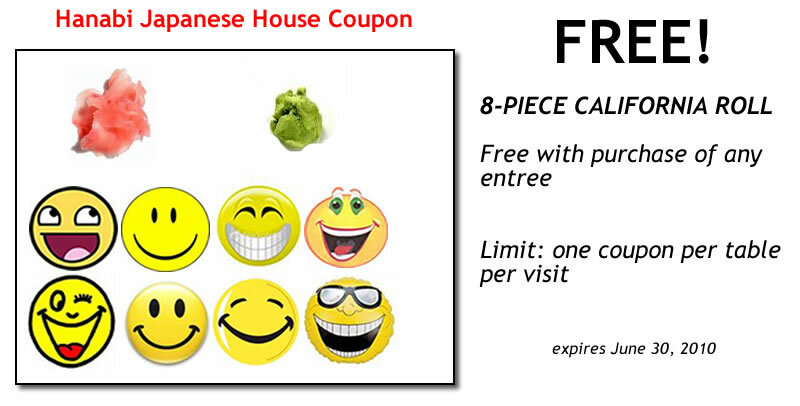 The owner wanted to do a 2nd quarter promotion of 8 pieces of California Roll free with any entree (click to enlarge). Julie looked at it and said no one can tell what those things are on the top. I said it is ginger and wasabi. Anyone who knows sushi knows what that is. Then she said I should put a picture of California rolls on the coupon. I said that's what those faces are supposed to be. She said there should be a picture and those faces are smiling at the picture. I would never have her as a client, haha..
By the way, if you are in the area and want to use the coupon, here is the link to the page: click here. 9679 Las Tunas Drive, Temple City 91780. Just wanted to let you know that this Friday you can get a free, no strings attached small order of french fries at Jack in the Box. He calls them his "new" fries that are crispy and golden so I suppose they are not the same as what they are selling now, which aren't bad but are no match for McD's fries. McD's web site and commercials are no match for Jack's, though. Have you been to the JITB web site lately? It's pretty clever, if you ask me. And, you can visit Jack's office, too (note: before you click on that link I just put there, be aware that he starts talking to you so if you are reading this at work when you aren't supposed to, turn off your sound.. but then if you turn off your sound there's no point in visiting Jack's office because you won't be able to hear what he is saying). Did you know that you can have Jack make a phone call for you? Like call in sick or do some other task over the phone? I'm serious - go over to his office web site and he'll explain how to do it (assuming you sign the disclaimer). I think the economy is improving. You might say Duh, have you looked at the Dow Jones Industrial Average and noticed it went over 11,000 yesterday?? Yes, I have noticed that, thank you, but that isn't why I say the economy must be improving. The reason I feel that way is because I am starting to get those annoying checks from my credit card companies. You know, those "checks" they send you that you can write to anyone and when they are cashed the amount is charged to your account, along with outrageous fees and interest charges. I hadn't received any of these things for quite a while - I can't even remember the last time I got one - but the past few days I've gotten two of these offers. 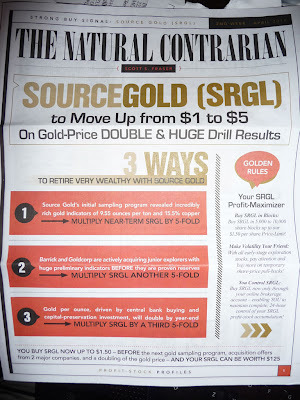 Then the other day I saw an ad in the newspaper for one of those irresponsible home loans/refinance loans from a lender. You know the kind - advertising some really low interest rate with the fine print that tells you what a sucker you are if you go for it and how it will adjust upwards after a few months to a level that you won't be able to afford. Ah, those things are coming back. I know the economy has picked up but I thought it would still be a while, like when the Dow hit 12,000 or more, before we started seeing the kinds of offers that brought us down in the first place a few short months ago. Speaking of comebacks along a different vein, I see that Conan O'Brien will be returning to late night television! Whoo hoo! Not on a major network, but on cable. I bet all his fans are so thrilled to hear about it! Not me, I'm not one of them. I know that's got to be the news of the year but I have never understood his popularity. I watched his old show several times, attempting to discover why some people are nuts about him but I just don't see it. I'll take Jay Leno any day of the week over him. That's the two cents of the day! There hasn't been much going on lately and thus there hasn't been much motivation to write. Work's been taking up a lot of time and a lot of thinking space as well. I didn't even do my weekly Costco trip on Saturday because of having to go into work that morning. But I did go to Costco on Sunday. I mean, you can't imagine me missing a trip to Costco for any given week, can you? The strawberries looked decent so I took a chance and bought a package (4 lbs for $4.24 - yes, I know Ralph's has them cheaper but I don't think I will ever buy any strawberries from them again after trying the deceitful ones from last time). I tried some this afternoon and these were like strawberries should be - that is, they tasted like strawberries. They could have been better, but at least were I to eat them blindfolded, I would be able to identify them, unlike the ones that came from Ralph's the other day. For lunch we tried a new place in Monrovia, called May's Cajun Kitchen. New for us, that is. Apparently they've been open for business for nine months and though we've passed it frequently, we never even noticed it. Julie's coworker recommended it so today we gave it a try. The menu consists mainly of chicken wings and shrimp, in various flavors: cajun, lemon pepper, salt & spicy, garlic butter or popcorn for the shrimp, and buffalo, cajun, crunchy, sesame or salt & spicy for the wings.There's also chicken bowls, fish, cajun sausage, clam chowder and a few other things. You order at the counter and your food is brought to your table. I tried the cajun shrimp combo, which consisted of the shrimp, a scoop of rice (you can have fries instead if you want) and some vegetables, plus a drink. For $5.99 that was a pretty good deal. Julie had the lemon pepper chicken. So how was the food? Well, it's not worth a drive across town but it was tasty, fresh and worth the money. It's a very nice change from the usual fast food menu, that's for sure, and the place itself has a nice open look and is spotless. We plan on going back because we liked the whole operation. May's is owned by a very nice and friendly Chinese couple. It's located at 215 East Foothill Blvd. in Monrovia, phone number 626-303-0400 and if you're anywhere in the area looking for something to eat, stop in and give them a try. You're not going to feel like you have been suddenly transported to the Bayou but you will be well taken care of. Donna, I hope you this doesn't cause you to lose too much sleep, haha..
Hmm.. now, which one is preferable.. this or a McRib? Best to have both, for comparison sake, I would say. I was on the phone with a coworker who works from her house. I asked her something and she paused briefly. Coworker: Oh, excuse me, I just ate a strawberry. Coworker: (pausing again at the unexpected question) Why no, now that you ask, it isn't! Me: Where did you get it? Coworker: My dad brought them over. He got them somewhere. Me: Julie brought some strawberries the other day and they weren't sweet either. Coworker: It's like every 5th one is sort of sweet or just a little bit sweet. I cut them in half and when I find one that has some sweetness to it, then I go looking for the other half..These have no taste! Me: The ones we got were nice and red and looked really good, like they were ripe. But when I tried them they were awful! Like cardboard. She bought them at Ralphs. Coworker: I don't know where my dad bought these but I guess I can put them in yogurt or eat them with ice cream. I was going to add sugar but then that sort of defeats the purpose of eating fruit..
Me: I can't believe these strawberries are so bad. And they look so good. That's really misleading! Julie said not to throw them away because she'd eat them. Put them in yogurt, like what you said. I couldn't believe it. Those strawberries looked like they were going to be delicious. But when I bit into one, I thought my tastebuds weren't functioning. Then I thought maybe this was an exception so I tried another one. Same thing. This was as bad as buying a tomato from the store! But at least tomatoes aren't deceiving. You know when you buy something that has an orange, doused with radiation look that it isn't going to taste very good, and you'd be right. But when you buy something that looks ripe, you would expect it to taste ripe! And isn't it supposed to be strawberry season right now? That's my slice of life for today.. which hopefully is sweeter than those strawberries. I was dumbfounded that such a large sum of money would be paid for something like this. As sleazy as this may look, I am sure that this is just a smaller, and more mild model of what goes on at the big brokerage houses under the guise of legitimacy. 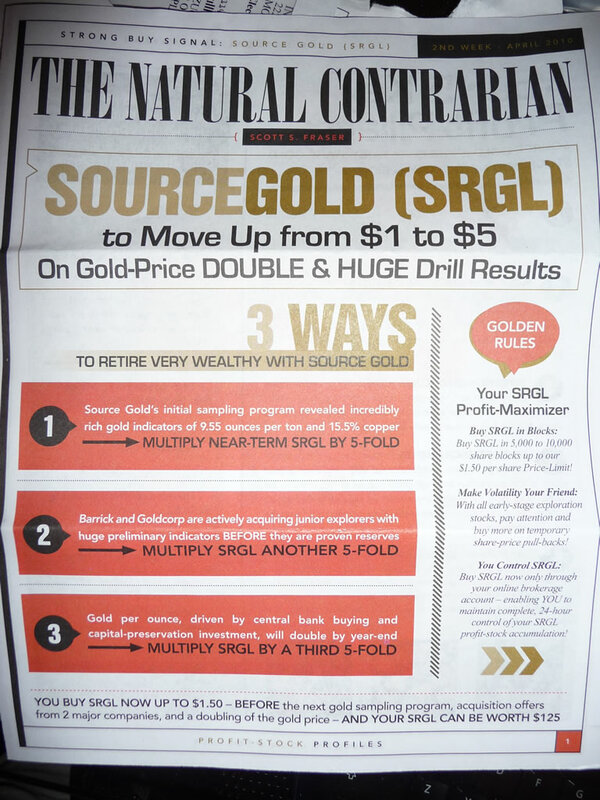 Here's a picture of the back page, where they try and get you to also subscribe to this so-called newsletter at a special rate. I also put the return envelope in the picture so you can see what cheapskates they are - they make you use your own stamp! I wonder just how profitable operations like this are? 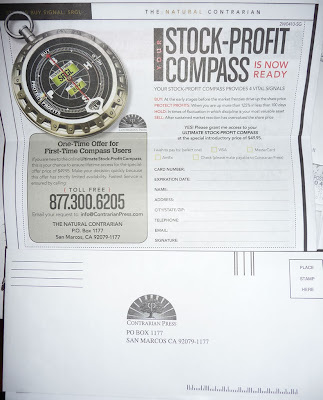 I'd be curious as to the response rate on the newsletter, as well as whether there is a blip on the charts for this stock they are pushing. 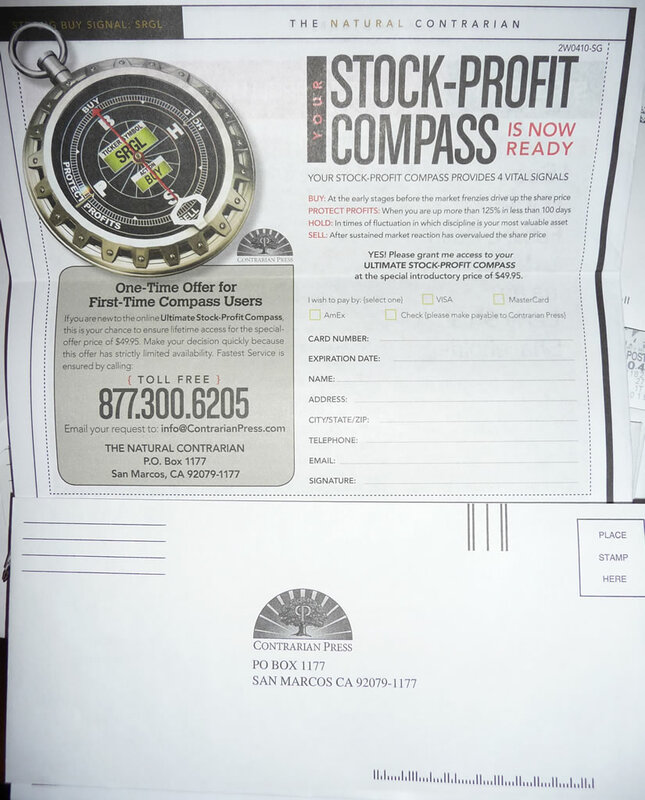 Okay, now those of you who want rush out and buy this stock, go ahead and send me an e-mail instead of posting it in the comment section. I will keep it hush hush, haha.. Thing is, what if this does turn out to really be that road to riches that we all hope for? Might be.. 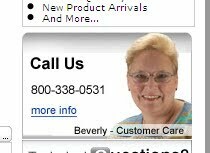 I am seeing more and more of those online store sites that have a "live chat" feature in which you can either call and talk with an operator standing by to help you with your product selection, or you can type in your question and begin an online chat session. Almost always, the invitation has a picture of an attractive young female, usually wearing a headset, just waiting for you to call or type your message to engage her in product conversation. I think this is an actual employee of the company (happens to be Parts Express). How often does the person at the other end of the line actually match up with the impression you get from hearing their voice? Or reading their e-mails? I hope you all had a blessed and joyous Easter! I spent part of the day watching a 1964 concert on DVD that was filmed at the Santa Monica Civic Auditorium. Click here for a link to the product page at Amazon. Clips of some of the performers riding around the Venice/Santa Monica area were interesting to watch, just to see what things looked like back then. I also got a kick out of watching the go-go dancers jump and bounce around on the stage with their big hair look. Before Michael Jackson, there was James Brown. You'll see what I mean when you watch the YouTube clip below. For me, he was the highlight of the concert, although there were lots of good moments. On another note, I spent part of the day switching my e-mail program from Outlook to Thunderbird. We use Outlook at work, since we also have Microsoft Exchange and supposedly the two integrate to provide you with all these wonderful features, but I have concluded Outlook stinks. So I am leaving all my work e-mail on Outlook but everything else has been moved to Thunderbird. As if anyone cares, haha..
And that's about it.. and like I said, before Michael Jackson..
Oh my goodness, look what I got in my e-mail box today (Thursday).. 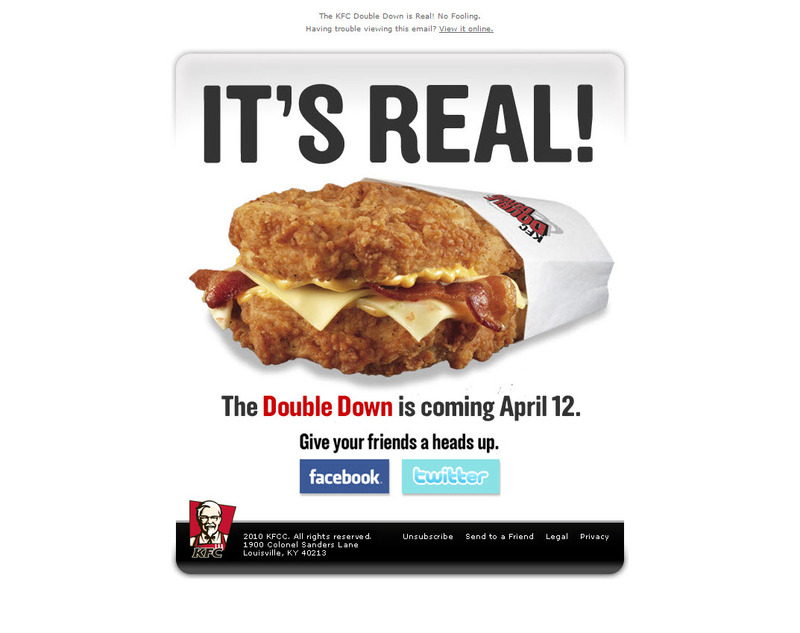 I think what they mean by the name of this new concoction, "Double Down" is that it will kill you twice. 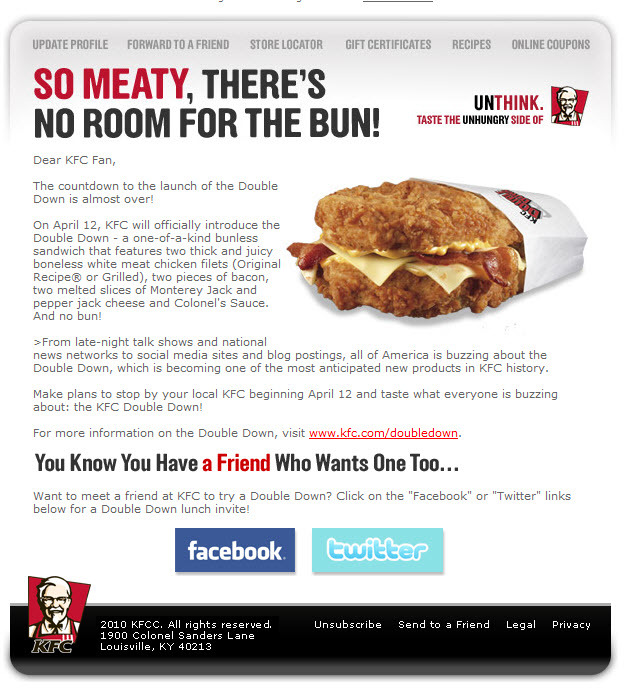 Double the level of saturated fats! Double the level of cholesterol! I wonder if that is fried chicken or fried bread? Or both? My friend Roosevelt Clucksworth would be horrified. 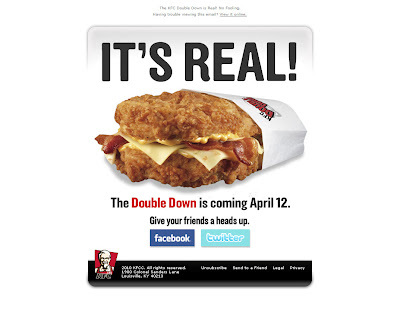 But then maybe this is just an April Fool's joke? Someone posted this on a message board the other day. After I read it, I was thinking that this is one of those things that seems to make a lot of sense, yet there has to be some sort of flaw in it. After reading it a few times, it still seems to make sense. The farmer asked,'What ya gonna do with him? The only thing that doesn't make sense is that last line. No one in our government is that clever.